March 10, 2019.- A verdict from India’s Supreme Court has ordered 20 state governments to evict more than a million families living on forest land before the 27th of July. These families live in and around 500 wildlife sanctuaries and 90 national parks; but many live there sustainably and have protected the forests long before these areas were declared parks and sanctuaries. On the 13th of February 2019, India’s Supreme Court ordered the eviction of over 7 million indigenous and tribal peoples from their forests, making them squatters on their own ancestral lands. The decision was based on an appeal from several conservation organisations, who claimed that these peoples were the reason for deforestation and dwindling wildlife populations. However, this argument flies against overwhelming evidence that Indigenous Peoples and local communities have been achieving better, more sustainable, and more cost-effective conservation outcomes for centuries. The Supreme Court decision to evict millions of forest-dwelling indigenous peoples from their home in India is catastrophic. While the Government of India signs off massive concessions in the forest areas to extractive industries with one hand, they evict the defenders of the forest with the other. They do this using a conservation argumentation. The irony is that by implementing this old-fashioned and dangerous conservation viewpoint, indigenous peoples are seen as a problem rather than a part of the solution to protect and maintain the forests, explains IWGIA’s Senior Advisor Signe Leth. In 2006, the Forest Right Act was adopted. The Forest Rights Act gives tribespeople and other dwellers who live on forest land for three generations (before December 2005) the legal right to live and work on the land. Shortly after the adoption of the Forest Rights Act, wildlife groups petitioned the court, saying India's limited forests were deforested by forest-dwellers. Since 2006, 1.8 million claims have been accepted and land titles handed over to families living on 72,000 km2 of forest land. However, more than a million applications have since been rejected. 13th February 2019: India's Supreme Court ordered the eviction of more than a million households living on forest land (after having had their claims declined) by the 27th of July. Since colonial times, the forest department held the rights to access, manage and govern all forest land and resources across India. The Forest Rights Act of 2006 changed that by reinstating the rights of communities to manage their local forests and resources on their own. India’s Parliament understood that villages always managed local forests and resources sustainably; because the ecosystem held the key to a tribal way of life that embodied their customs, cultures, belief systems, communities and homes. 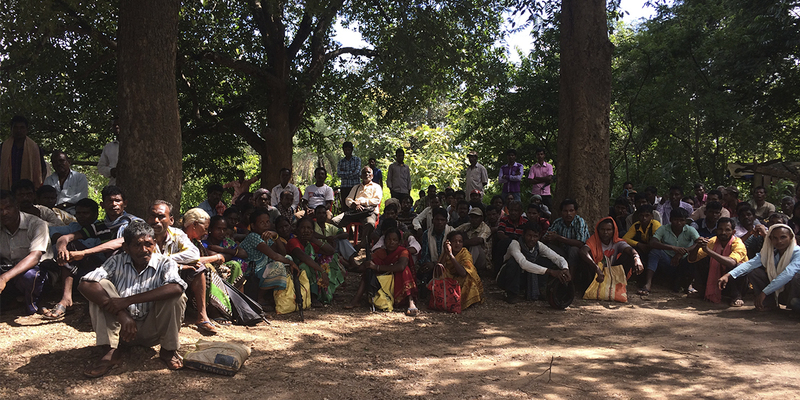 The law ultimately made the gram sabha (village council) the statutory body that protects and manages the forest, because they know their communities and how to manage their local resources best. The whole process of legitimising their land through an abstract concept like forest rights is more than difficult for people who have spent their entire lives in the forests. In many cases, District Level Committees have rejected the application or given much less land than the ones they have been cultivating, merely on the basis of the forest department’s opinion and without considering the other proofs approved by the Act. Some organisations claim that even when they managed to provide this documentation, many states rejected the community’s applications based on weak argument; because, e.g., they wanted to sell the land to extraction companies. In many cases, the establishment of the gram sabhas (village council) as the statutory body was neglected by local duty-bearers. Through this faulty process, the claims from more than 1.1 million households have been rejected. With India’s Supreme Court deciding to evict these peoples from protected areas they may now suddenly find themselves without home or land. We depend on the forest for our survival, therefore, we cannot even imagine our life without the forest, explains Mr. Purandra Munda. Mr. Purandra Munda is the Chairperson of a ‘Forest Rights Committee’ that was formed in his local village when they heard about the possibilities of the Forest Rights Act. The village is dominated by the Munda Adivasis, whose livelihood is wholly based on agriculture and forest. Most of these people own some patches of revenue land; and some of them also cultivate on the forest land, but without entitlement papers. Through the ‘Forest Rights Committee,’ 36 villagers filed their land claims, but only six people got their rights recognised - and all of them received less land than they initially claimed. We have been cultivating on eight acres of forest land for three generations, but I was given entitlement of merely seven decimals of land. How can my family survive with such a small patch of land? This is an injustice to me. I’m not going to leave my land, tells Bando Munda who applied for four acres of land but only received two decimals (edit: one decimal is equivalent to 1/100 acre). The Central government must immediately act to reverse the February 13th order, by any means appropriate, and to ensure that all rejection of claims under the Forest Rights Act is reviewed through gram sabhas (not only by officials). The Central government must ensure that, as per law, every village in forest areas in the country receives title to protect and manage their community forest resources and to use their non-timber forest produce without any conditions or restrictions. All compensatory afforestation and other forestry funds (including Joint Forest Management) should only be utilised under the control of forest-dwelling communities through their gram sabhas. Stop all diversion of forestland for corporate projects without the consent of concerned gram sabhas and without recognising rights. Ensure that all officials responsible for violating forest rights are prosecuted.